There were 3 total competitors. 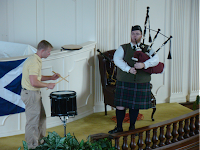 Bagpipe Setup were Boothe drones with Selbie tenors and Apps/Naill bass (blue), Kron ABW Medalist chanter with Soutar reed and Ross small zip bag. Here are some photos from the concert last Saturday. Thanks Mike. 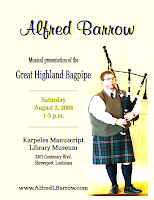 This past Saturday, August 2, 2008, I played the pipes at the Shreveport Karpeles Manuscript Library Museum. 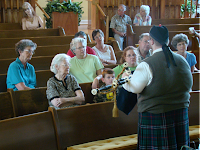 The concert was to help raise funds for the museum. 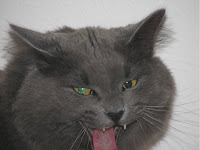 Below are some videos and a poster from the event. 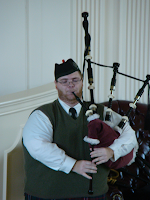 For those interested: The pipes are Boothes with ABW Kron Medalist (brand new) with Soutar reed. 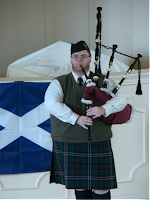 This is the second outing for this chanter and is quickly becoming a favorite. From left to right: Mike McConnell, one of my students, Seth Barrow, & Me. After the concert, we practiced a bit and recored our first go at playing "Amazing Grace" together. 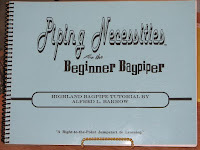 My bagpipe tutorial "Piping Necessities for the Beginning Bagpiper" now has a companion book--a bagpipe prescription and staff paper journal. This new book has been designed to "collect" all the verbal thoughts and scribbles used in teaching the bagpipe art. This makes it easier for the beginner bagpiper to refer back on a lesson or recommended exercise (or prescription). This journal i s also great for composing tunes and harmonies . The Prescription & Staff Paper Journal features 50 pages each of prescriptions and blank staff paper pages. 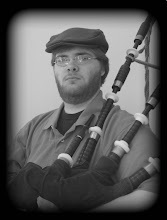 Visit www.alfredlbarrow.com/PipingNecessities.html for more information.